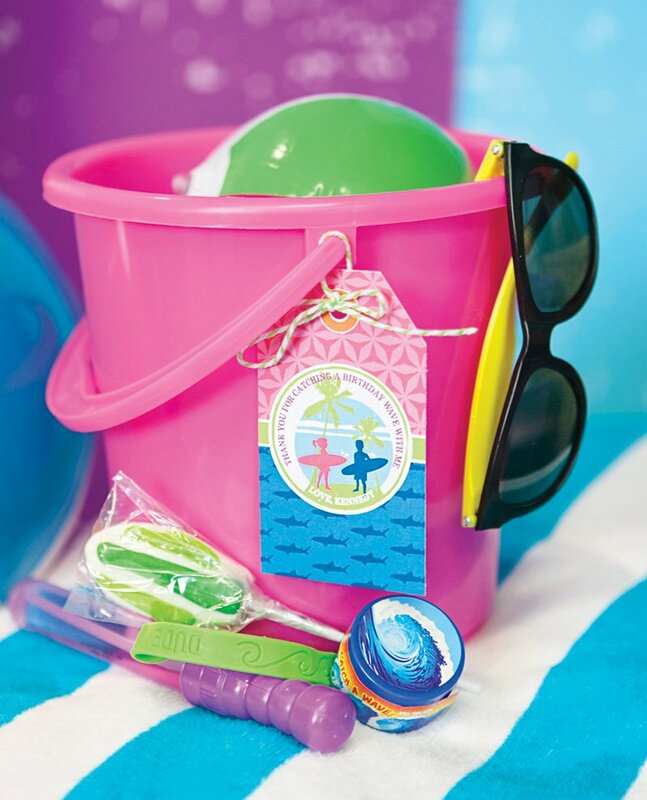 I’m especially loving the tiki hut with all of those mini, treat-filled “sand” buckets — perfect for little hands! 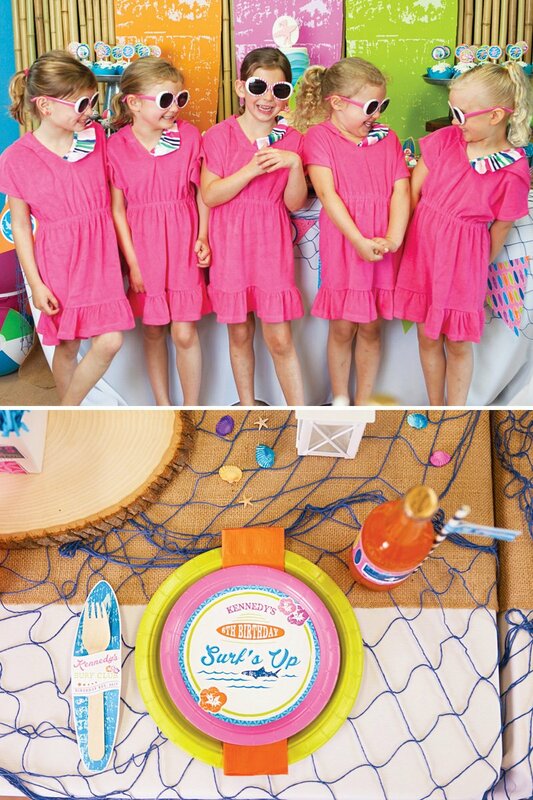 Hang ten and check out all of the adorable fun these girls had, as beautifully captured by Karina of A Fresh Take Photography. 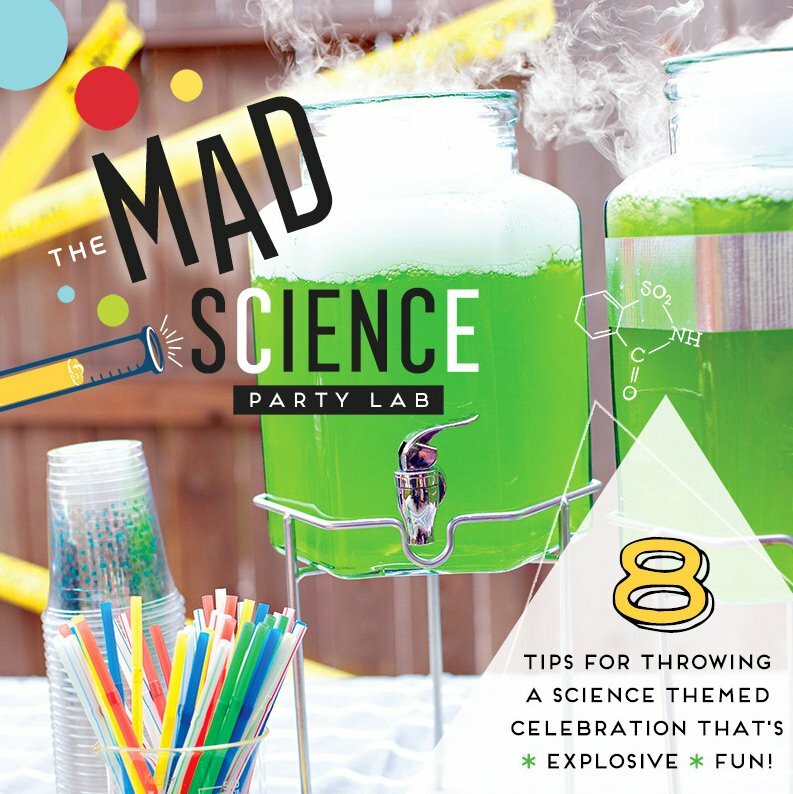 Krista and Jen know the importance of making a splash from the get-go and love setting the stage for an exciting party. 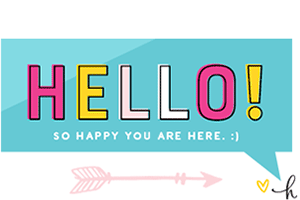 Colorful invitations with a bold pattern and bright colors were mailed out to all of the lucky invitees. Anders Ruff Custom Designs personalized the details and even created a coordinating return address label. Driftwood Printing handled all of the printing needs for this party, both large and small format. 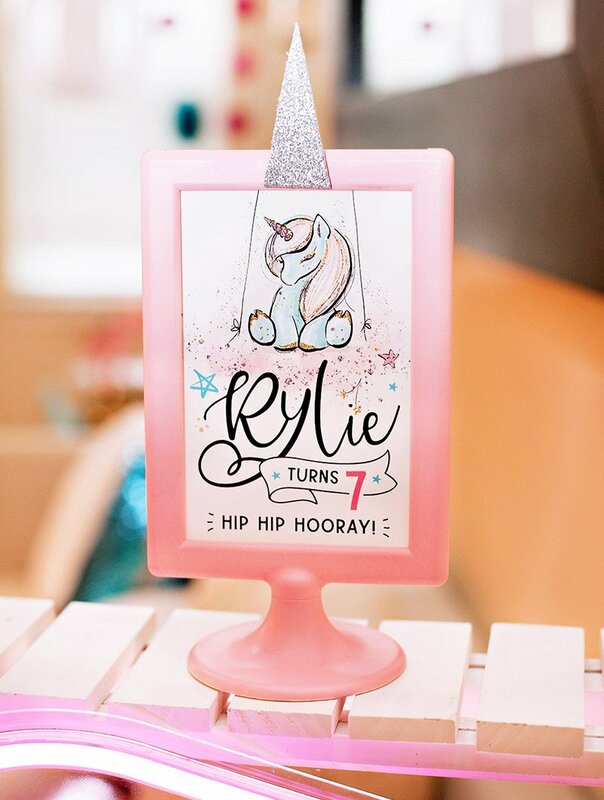 We love how vibrant the colors are and the quality of the printing. Working with a small “party room” at the local community swimming pool, Jen & Krista worked hard to transform the space into Kennedy’s Surf Club. 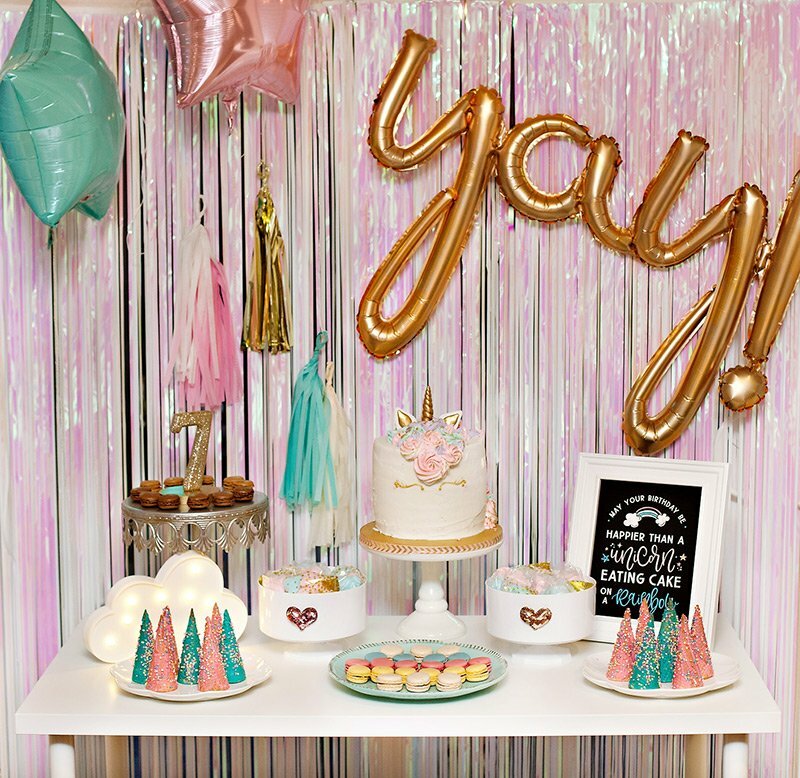 To set the tone for this surfing birthday party, the main wall became the setup area for the dessert table. 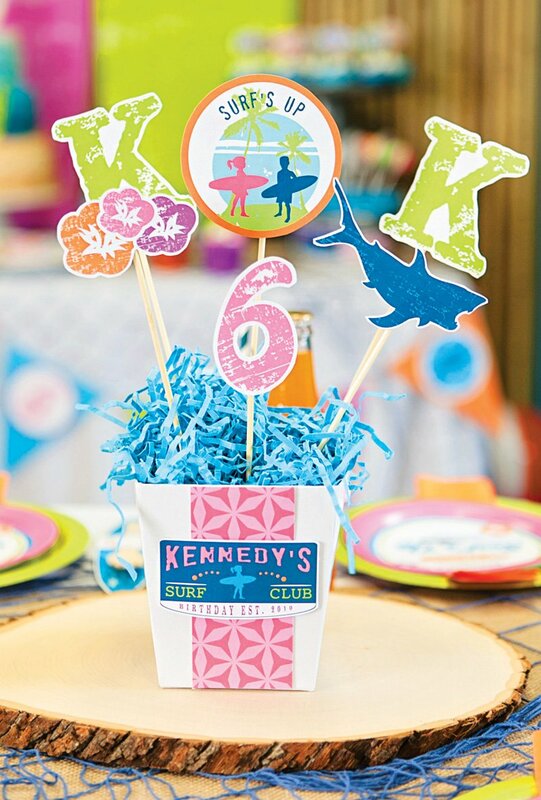 An 8′ x 8′ tall bamboo fence (Forever Bamboo) was used as a creative backdrop option to which 6′ tall printable surfboards and a surf club sign were hung with fishing line. A simple white tablecloth was decked out in a sandy brown burlap runner (Koyal Wholesale) and topped with a blue fish net (Party Cheap). Vibrant pennant style bunting (from the Anders Ruff printable collection) was hung from the front of the table. Sand pails full of beach balls (Oriental Trading) littered the floor on each side of the table. 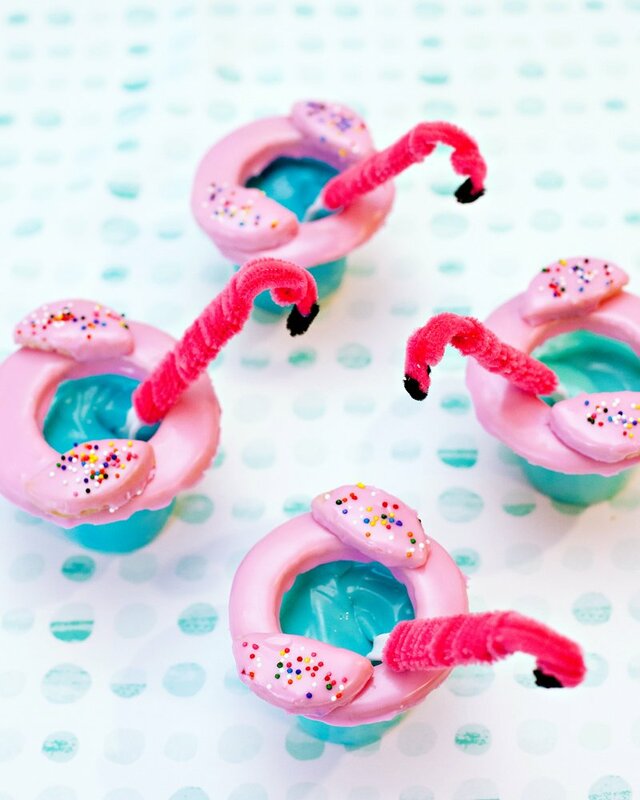 Surf and beach inspired treats added the magic touch. 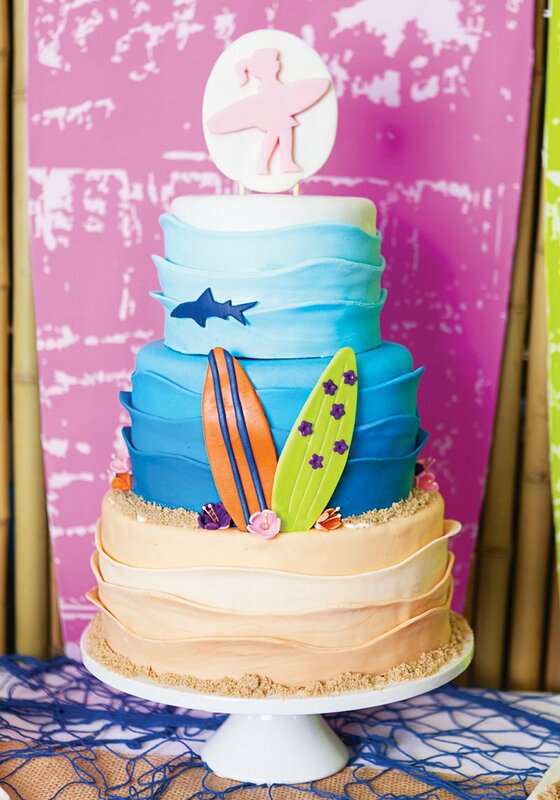 The 3-tiered cake masterpiece by 4 Kids Cakes combined sand, sea and surf as well as darling inspiration from the surf party printable collection. Cupcakes, perfect for little hands, were topped with printable logos and wrapped in awesome wave cupcake wrappers (Kiss Me Kate). 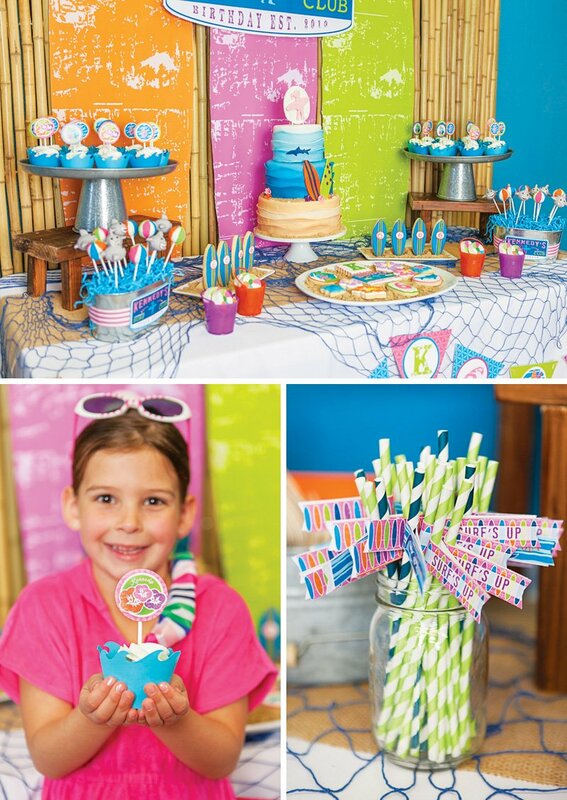 Tin containers were stuffed with blue paper shred (Nashville Wraps) and displayed the most adorable shark and beach ball cake pops from Bella’s Bakery. Also by Bella’s Bakery, the darling beach ball chocolate covered Oreos were creatively displayed in mini pails filled with brown sugar sand. 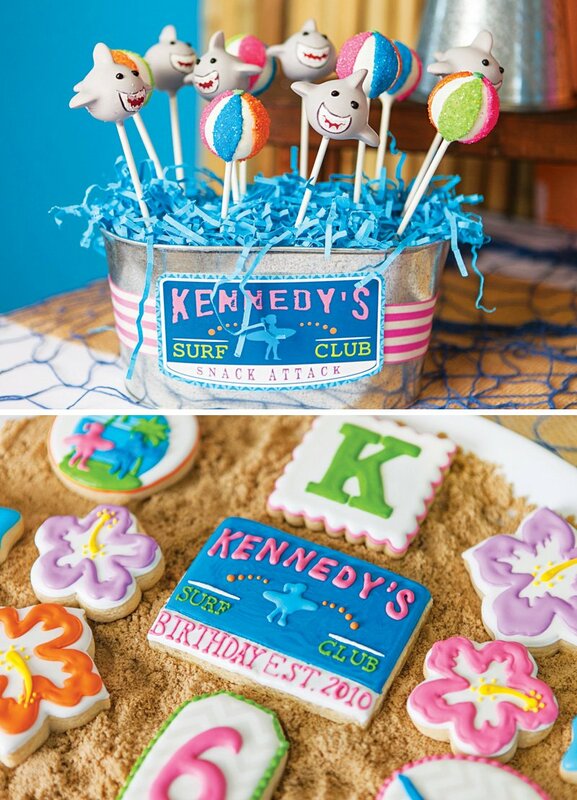 Brown sugar sand was layered on white platters and provided the perfect foundation for displaying amazing surfboard and surf inspired cookies by the talented The Sugar Canvas Boutique Bakery . 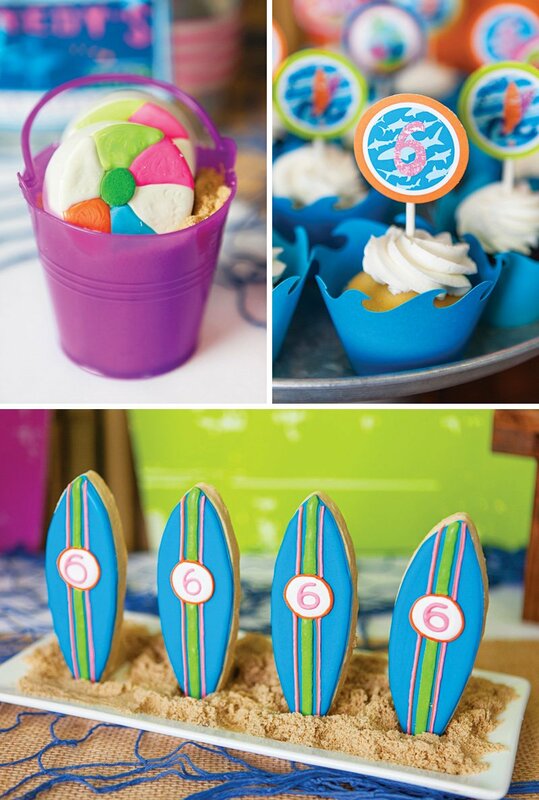 In keeping with the surfing birthday party theme, dining tables were set to coordinate with the dessert table. You’ll notice the repetition of the burlap runners and blue fish net toppers. Krista and Jen added colorful starfish, shells and mini lanterns from Oriental Trading for some additional beach inspired flair. Wood rounds provided a weathered platform for colorful centerpieces. 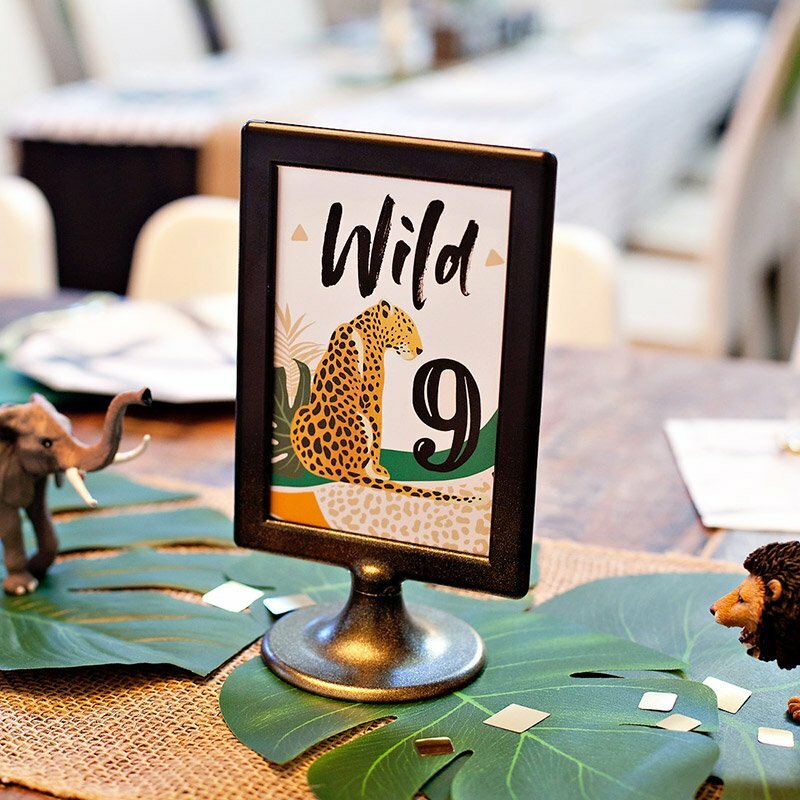 The centerpieces were put together from paper pails loaded with shred and printable designs attached to bamboo skewers. 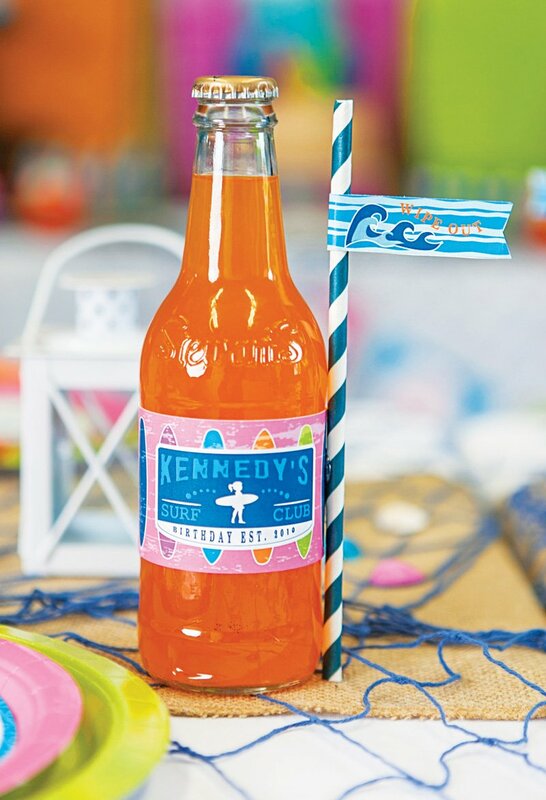 Place settings were personalized with cute custom party logos on plates, bright beverage labels on the orange soda bottles and darling printable party flags attached to paper straws (Hoopla Events). Bold colored plates were layered with orange napkins. 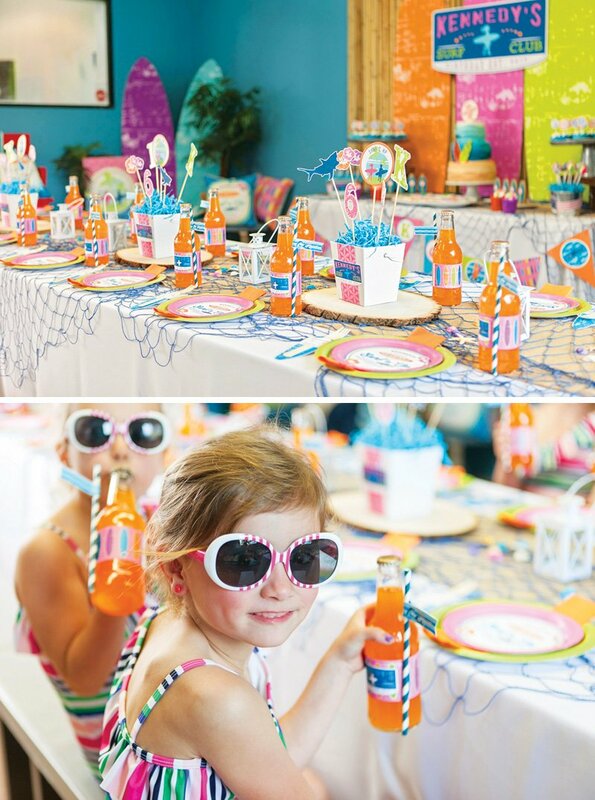 Our very favorite element of the place settings were the adorable surfboard utensil holders! These were created for displaying wooden cutlery from Koyal Wholesale. 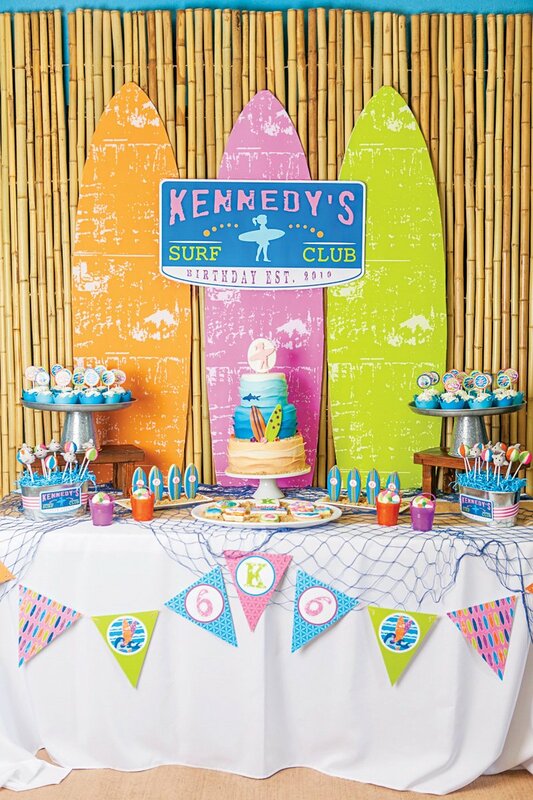 To make the surf club room more cozy, Krista and Jen set up a surfing birthday party lounge area. Using throw pillows and an art canvas customized using party printable designs, a bench was spruced up for stylish seating. 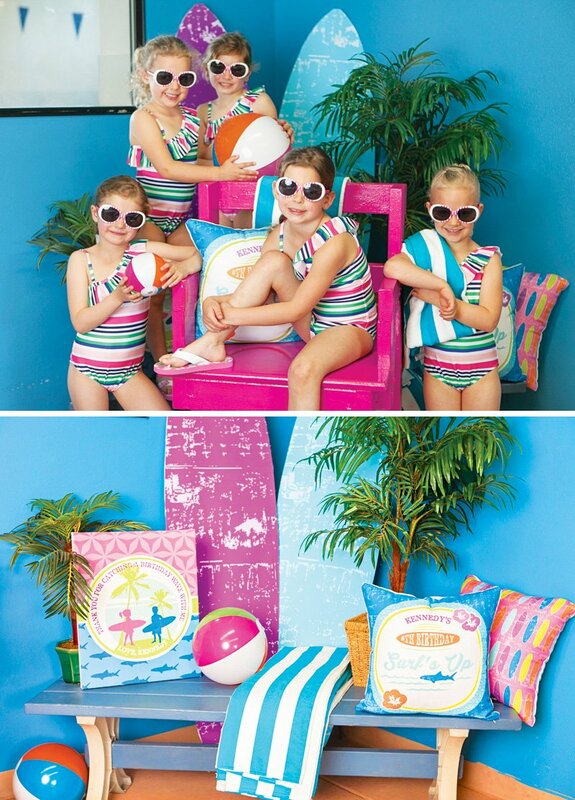 Small palm trees, beach balls, a cabana striped towel and printable surf boards completed the look. 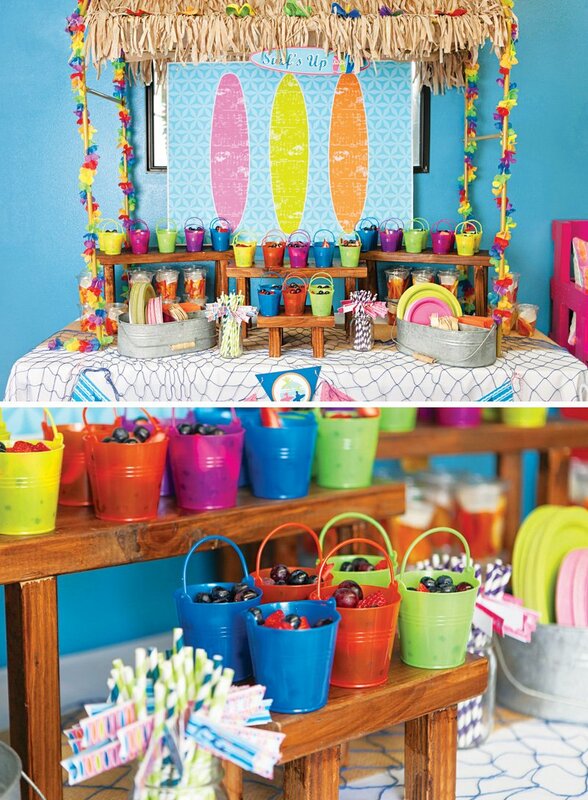 More for convenience than cuteness, a tiki bar area was styled to display some of the healthier snack options. An enlarged surfboard poster provided the backdrop. Wooden stands were littered with mini pails filled with fresh fruit. Lidded containers with fresh veggies and ranch dip were also neatly displayed. Individually packaged gable boxes were embellished with custom “Snack Attack” labels and filled with all sorts of yummy munchies, each individually bagged and tagged with a cute label. Our personal favorite was the “shark bait”— a package of gold fish crackers. 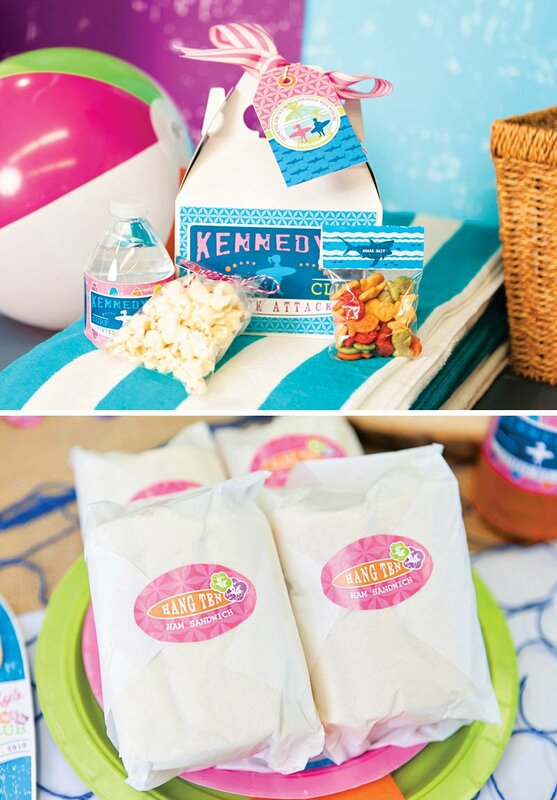 The main meal consisted of “hang ten” ham sandwiches, packaged up in food paper and labeled with a custom label. 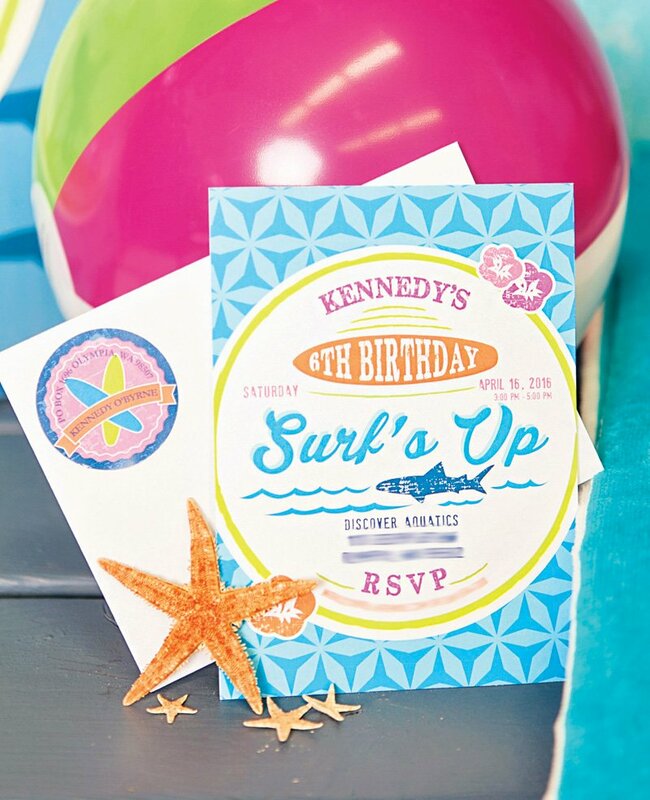 Now that the party is over, Krista and her daughter Kennedy look forward to sending off theme and color coordinating thank you notes to all of the guests who made this surfing birthday party so much fun! How in the world did they keep those sprinkles off the white of the beach ball on those cakepops. That’s serious talent. Beautiful!